The horse’s hoof is a marvel of evolution that protects a network of bones and tendons while supporting a large and fast-moving animal. 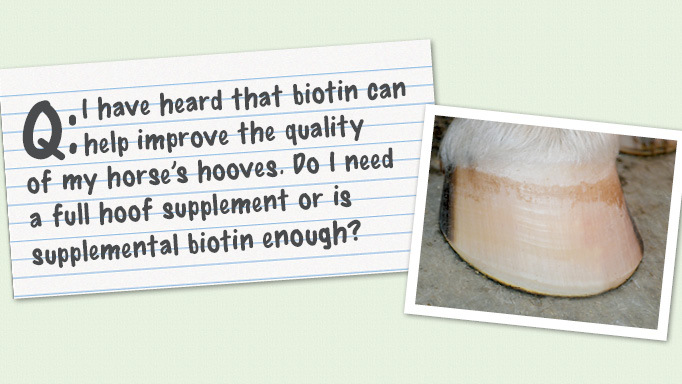 But for horse owners and veterinarians, the hoof has one major disadvantage: it’s not transparent. We can’t see what’s going on inside it. Of course, people have tried. X-rays will give pictures of the bones, and ultrasounds through the horse’s frog can identify some issues with soft tissue. But both of these are difficult to do and provide only limited information. That inability to get a good look at the hoof’s inner workings made it difficult to diagnose conditions such as navicular disease. Ontario Veterinary College professor Dr. Nicola Cribb explained that in the past “almost all chronic pain at the back of the horse’s foot was lumped under the name navicular disease.” Early writings on equine matters mention navicular disease in the 1700s – it’s a problem that has been around (and dreaded) for a long time, because it is progressive and generally incurable. Today, though, we are able to obtain a much more accurate picture of what is going on, and, therefore, plan for more effective treatments. Now, with the use of Magnetic Resonance Imaging (MRI) to assist with diagnosis, there’s a new understanding about the causes of this pain. For example, a June 2009 study in Veterinary Radiology and Ultrasound looked at 72 horses with a recent onset of navicular syndrome. All had normal findings on x-ray, so the researchers performed MRIs on both front feet to see what this would reveal about the causes of the horses’ pain. The MRI tests performed by these researchers found that for 33 per cent of the animals in the study, the most serious abnormality was in the navicular bone; in 18 per cent there were pathologic changes in the deep digital flexor tendon; 15 per cent had pathology in the collateral sesamoidean ligament; and 10 per cent in the distal sesamoidean ligament. Another 18 per cent had multiple, equally prominent areas of pathology. The abnormalities in the navicular bone did not show up on x-rays, but could be caused by hemorrhage, synovial fluid, bone necrosis, fibrosis, or inflammation. While they were the most severe problem for one-third of the horses, some level of change in the bone was seen in about 86 per cent of the horses. One interesting finding: in about seven per cent of the horses, the most severe damage was seen not in the hoof where the horse was lame, but in the opposite limb. The researchers point out that when horses were experiencing pain in both front legs, they often did not appear classically lame, because both legs were equally painful to walk on. This sometimes leaves the owners unaware of the problem, and the researchers commented that, based on the degree of damage they observed, some of the horses may have been in pain for some time, although navicular syndrome was only recently diagnosed. In some, the pain seems to switch from side to side as the horse attempts to relieve the discomfort in one foot then the other. In this study, many of the horses were Quarter Horses used for western pleasure. The researchers believe that this is the reason why only 18 per cent showed tendon damage as the most serious problem, when other studies that included primarily jumpers found more than 35 per cent of the horses with navicular syndrome had tendon damage. Studies like this one, said Dr. Cribb, are giving us new insights into navicular syndrome and providing baselines for further research which may lead to better treatments. Can you prevent navicular syndrome in your horse? Some breeds are at greater risk from the get-go, Dr. Cribb said. 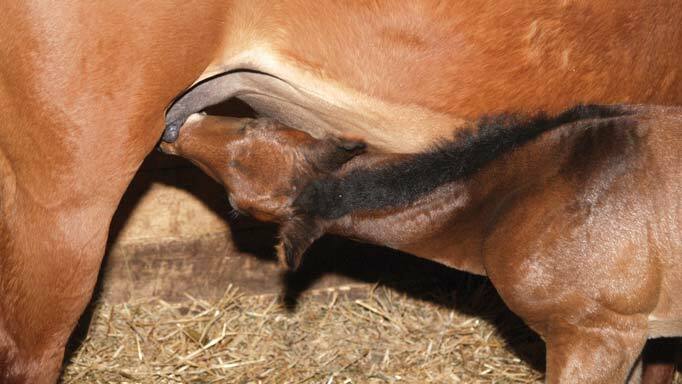 Quarter Horses, Thoroughbreds and Warmbloods are more likely to develop this syndrome, but conformation is a key part of this. “If the horse’s foot is not well-balanced, he’ll be more likely to develop a problem,” she added. In any breed, the horse with contracted heels or underrun heels is at greater risk. The short, straight pastern, small feet and “downhill” build often seen in Quarter Horses are all risk factors, as are the long toes and low heels seen in Thoroughbreds. Research suggests that there may, in a small number of cases, be another hidden factor. A 2016 study published in BMC Veterinary Research investigated three horses with navicular syndrome that had been lame for more than six months. One was a Quarter Horse and the other two were Warmbloods. The researchers discovered through x-rays of the horse’s feet that these animals had navicular bones that were segmented into two or three parts. It was clear to the researchers that the horses were born with these defective navicular bones and that the segmentation did not result from trauma, but they weren’t able to determine if this was hereditary or due to a spontaneous mutation or developmental error. In the first few years of the horse’s life, he would be expected to perform normally, but the segmented navicular bone would soon break down as the intensity of work increased. Even if your horse’s conformation is not ideal, Dr. Cribb said careful trimming and shoeing may help reduce the risk. Anything that makes the foot unbalanced will increase stress on the bones and soft tissues of the navicular area. Given the roles that force and stress play in causing this damage, it’s easy to see that regular riding on a hard and unforgiving surface will increase the risk. Certain sports are also more likely to contribute to the development of navicular syndrome, including any jumping, barrel racing and racing in general. Frequent riding on sloping ground also puts stress on this area, as does standing in a stall for many hours at a time. “It’s often the combination of problems with conformation and the intensity of the sport that causes the damage,” noted Dr. Cribb. The most obvious symptom of navicular syndrome is pain in the front feet. If the problem is worse in one foot (or is only in one foot) then the horse will usually be lame; if the horse has it in both front feet then he may develop a short, choppy stride. Often the horse appears to be trying to “tip-toe” because the pain is primarily in the back (palmar area) of his feet and he avoids putting weight there. At rest, he may “point” one toe, trying not to put weight on that foot; often the horse will alternate which foot he points or may stand with both front feet ahead of the body, trying to keep most of his weight on his hind legs. “There is rarely any swelling or heat detected on the leg although there may be palpable heat in the hoof wall,” said Dr. Cribb. “That’s because the problem is all contained within the hoof.” Depending on what structures are involved, the pain may come and go, or may get steadily and progressively worse. Of course, navicular syndrome is not the only cause of pain in the hoof, and when lameness develops, owners may try some home remedies: resting the horse and administering anti-inflammatory medication. 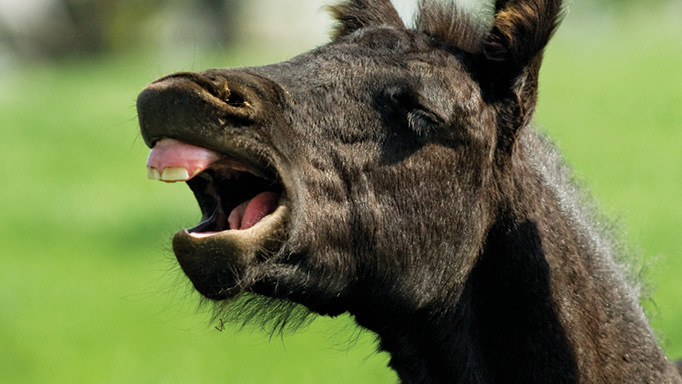 Dr. Cribb, however, believes that the horse should be seen by a veterinarian at the first sign of lameness. Your veterinarian will do a lameness evaluation to localize the pain, possibly using temporary nerve blocks to find out which parts of the foot are affected. An x-ray may reveal some damage, but Dr. Cribb said that an MRI is “the gold standard” for diagnosing navicular syndrome. Corrective shoeing is another common recommendation, and Dr. Cribb finds that horses who have damage to the soft tissues (such as tendons) around the navicular bone can recover with those three treatments in place (rest, anti-inflammatory medication, and corrective shoeing). However, the outcomes are variable. Once the horse is comfortable, a controlled exercise program should begin. Some horses are able to return to work – again, depending to a large extent on what parts of the hoof are involved, and to what degree – while others will only be able to work at a lower level, or may need to be retired. Another risk to the procedure is the potential for growth of a neuroma, a painful mass of nerve tissue that can grow where the nerve has been cut. Sometimes this can be dealt with by repeating the neurectomy surgery. 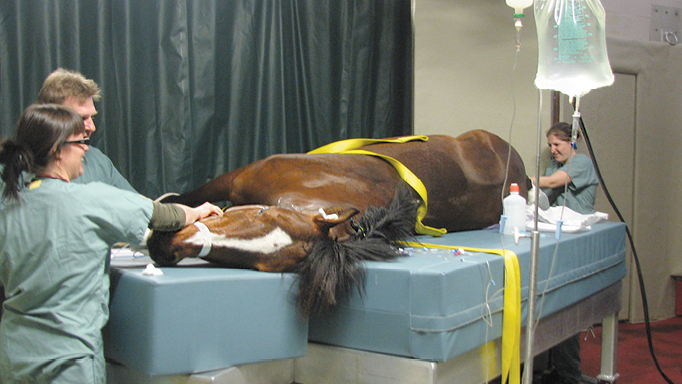 These treatments can often give the horse many pain-free years. However, navicular syndrome tends to be progressive and many owners ultimately either retire the horse (if he can stay comfortable with pain medications and rest) or have him euthanized. Dr. Cribb is optimistic that new, targeted and more effective treatments will be found in the near future. “We’ve only been doing MRIs on horses’ hooves for about 15 years, and this is a field being actively researched,” she said. In the past, treatments had to be generalized: veterinarians didn’t know whether the bone was involved or not, or which of the tendons and ligaments might have suffered damage. Without that information, it was hard to determine which treatment was likely to be helpful for each case, leading to a lot of frustration. Extracorporeal shockwave therapy was first tried as a treatment for navicular syndrome in Germany in 1997, then studied in 2004 by a researcher in the U.S. Now Dr. Angela MacKay of the Western College of Veterinary Medicine in Saskatoon is conducting a study that uses MRI to see what’s going on in the horse’s foot before and after the treatment. This shockwave therapy uses a machine that creates a pressure wave that is transmitted to the horse through a special probe held firmly against the skin. 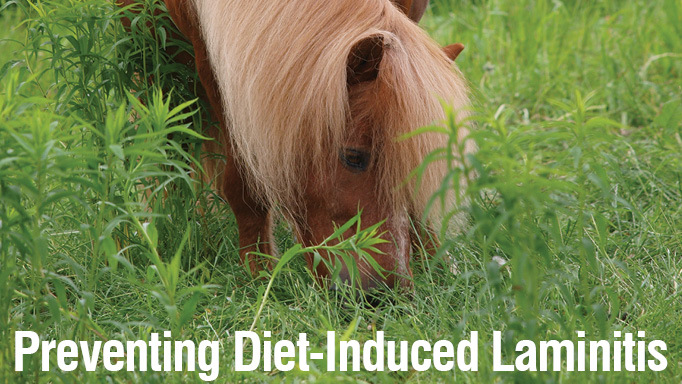 Although it can be uncomfortable for the horse, Dr. MacKay finds that giving light sedation before the treatment allows the horse to tolerate it quite well. Previous research suggests that the shockwaves stimulate an anti-inflammatory response, increase the production of growth factors that can promote bone healing, and may provide pain relief. Through this research, Dr. MacKay hopes to be able to determine if this treatment is more effective for certain causes of navicular syndrome. Comparing the MRIs done before and after will show if the injuries have changed in any way. The study, planned to include 32 horses, should be completed by late 2017.